It’s the theme park with a difference. Queues are deliberately kept short, attendance is restricted so there’s not too much noise and it there’s no gaudy advertising promising thrills and adventure. Yet Morgan’s Wonderland in Texas has proven a huge hit since it opened last year, attracting just the right number of visitors from 16 countries across the globe and from every American state except one. The difference? 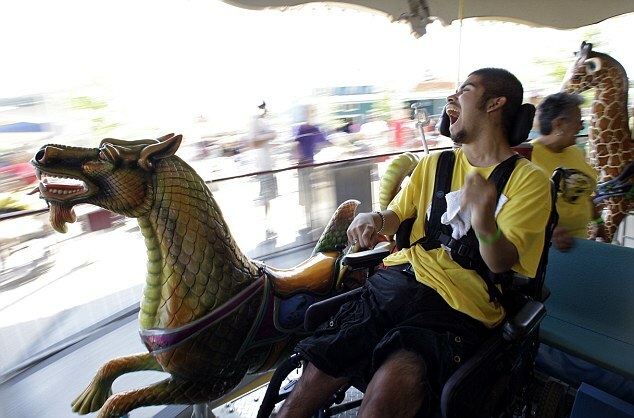 Morgan’s Wonderland is aimed squarely at children with disabilities, even if three out of every four of the people who pass through its gates are able bodied. The carousel has chariots for wheelchairs. Braille games decorate side panels on the jungle gym and table-high sandboxes allow just about any child to build a castle. Those suffering from autism, orthopaedic problems, the mentally handicapped and children who have seizures are among the most regular visitors. The park, outside San Antonio, is the first of its kind in the U.S. philanthropist Gordon Hartman named it after Morgan, his 17-year-old daughter, who can’t perform simple maths and struggles to form sentences because of cognitive disabilities. Morgan, so they simply stopped playing. exhausting, endless trudge from one overcrowded ride to the next. some rides even emails a free photo back home. ‘It’s so nice to have a place like this,’ said Tifani Jackson of Austin, Texas, who visited the park with her son Jaylin who has Williams syndrome, a rare genetic disorder that causes learning disabilities and slows development. As she spoke, Jaylin, 11, tried to pull her back to the off-road adventure ride, where rugged-looking Jeeps that are wheelchair accessible twist and turn through a short track. 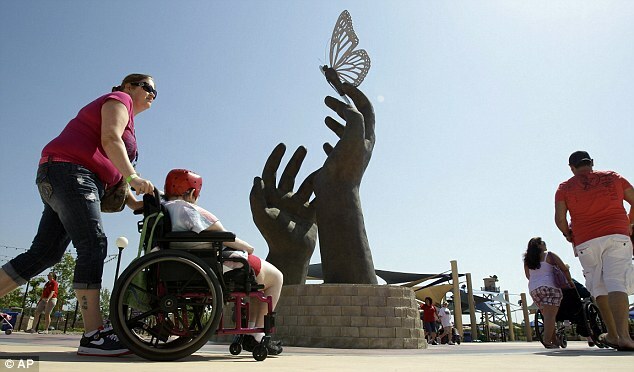 Other attractions at the 25-acre, $34 million park include jungle gyms wide enough to fit two wheelchairs side-by-side, and a Sitting Garden, a quiet and meditative place, that’s a favourite among parents with autistic children. back the right amount of invisible change. chasing a shadow any time someone steps in front of the projector. Loved, loved, loved reading this story. Karan has never really been to a theme park. Well, we were in Disneyland, on the one-and-only vacation we’ve been taken on, but he was 2 and eventually missed out on most of the rides because he was crying a lot/was upset. He hadn’t been diagnosed yet so we had no idea why he was upset in the crowds and amidst the noise.